Toyota Motor Corp. (NYSE:TM) has developed a test model for a “flying car” in partnership with a tech start-up. 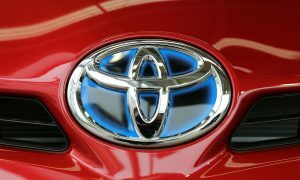 Toyota will invest 42.5 million yen ($386,000) in Cartivator Resource Management over the next three years to work on the new “Sky Drive” vehicle. Cartivator’s goal is to create a vehicle that offers a seamless transition from driving to flight. The Japanese automaker wants the tiny car to be able to light the Olympic torch in the 2020 Tokyo games. The companies still have a long way to go. The current prototype barely gets off the ground and tends to crash after several seconds. No one has ridden on Sky Drive yet, as it is still too dangerous. The group is now working on a better design to add more stability and plans to have the first manned flight in 2019. The automaker demonstrated the vehicle in a test flight on Saturday. The test model was composed of aluminum framing and eight propellers. The vehicle rose as high as eye level for several seconds before tilting and falling to the ground. Unfortunately, during the demonstration one of the covers detached from the frame and broke, damaging the propellers and ending the display. The car is still at an early stage of development. Cartivator started to develop a flying car back in 2014 with the help of crowdfunding. The start-up group currently employs about 30 engineers, including some Toyota employees. According to Nakamura, more than 100 people have applied to join the Cartivator team and ten new investors have come forward offering sponsorship. Toyota sees software and services as central to the auto industry. In recent years, the company has been aggressively venturing into robotics and artificial intelligence. The company has already invested a billion dollars in a research and development company in Silicon Valley. It also recently announced a five-year $35 million investment for autonomous and connected vehicle technologies at its research center in Ann Arbor, Michigan. Engineers at Cartivator hope to commercialize the car as the world’s smallest electric vehicle in 2025. Other companies around the world have also been competing to develop the first flying car. Airbus Group is working on developing a flying car under its Urban Air Mobility division. Uber Technologies Inc. announced plans to launch a flying taxi service by 2020.